Your hubby looks like a cool dude and your children are beautiful. I had this weird chick from Babycenter who used to comment every day and say she wanted to eat my kids' faces. It is this running inside joke with me and Jon. But now I see why she said it bc their faces are so precious I could eat them up. But I won't be that weirdo leaving those comments on your blog. That looks like so much fun, though no one looks even a little tired! Its like a really cute version of The Shining. They are so adorable. And so happy. 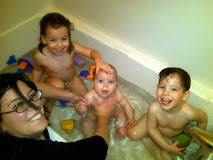 Ours are happy like that once bathtime starts, but before that it's cranksville in our house!! So you keep Aaron and the kids locked up in jail before bathtime? Good idea. And OMG, these comments made me laugh out loud - Nicole HAHAHAHAH!